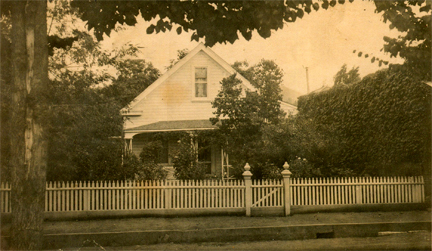 Originally the lot is owned by Duncan and McClenahan. The building on the lot burns in the 1854 fire. 1854 Wm. Odenheimer and Thaddeus W. Northey buy the property. Odenheimer moves his Eagle Cottage boarding house to the property and into a larger building. It takes care of 100 boarders and has a barber shop in the northeast corner. After burning, it is rebuilt by July 23. 1856 Northey sells his interest to Isaac A. Stevens. Odenheimer was drinking heavily. 1857 On April 4, Soderer and Marshall buy the property at a sheriff's sale and lease it to Charles Bombauer. By August 25th, it is destroyed by fire and the lot is purchased by Bombauer who rebuilds. 1859 The lot reverts to Soderer and Marshall after Bombauer fails to pay the mortgage. 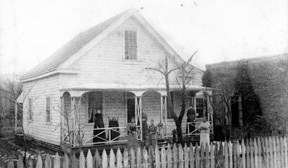 1860 In February, M.D.Kimball leases the Cottage. In April, Mrs. C. Bronson runs the business. 1861 In July, the building is again destroyed by fire. 1862 In October, the vacant lot sells to James Griffiths, Tim and Tom Hayes. 1871 The site is mined and abandoned. 1950 The state purchases the empty lot from Luckows, Nicolas and Peterson. 1960 The building is reconstructed with money from the College of the Pacific and the state. It is used by COP drama students in summer repertory at the theater. First year of use is summer, 1960. 1970s Used by Columbia College as classrooms until their facility constructed. 1980s Used as classroom for pregnant minors by Tuolumne County Schools. Front parlor used by spinning and weaving guild as store. 1994 Columbia Historic Preservation Society becomes concessionaire. The City Hotel corporation offices are on the top floor. 2004 Columbia Historic Preservation Society becomes Friends of Columbia SHP. The bottom floors are now Ranger/staff offices and the facility is rented for public meetings and docent training.